All our Whole Wheat breads are made with flour we mill fresh each day, and none of our products contain High Fructose Corn Syrup. Complete ingredient labels will allow you to check all ingredients, and we will be very pleased to answer your questions any time about what goes in to our breads. All our breads this month except Marble Rye and Lemon Sunburst (cane sugar) are sweetened with honey. Marble Rye is a Vegan bread with no egg wash. Cedar River Sourdough is unsweetened entirely and is also Vegan as are our Baguettes and French bread. Please keep giving us your input about dietary preferences so that we can make informed menu choices in the future. 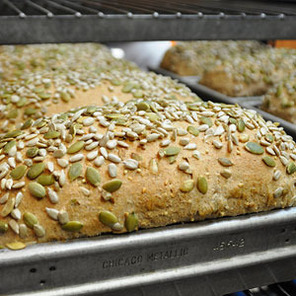 Any of our breads like Dakota or High 5 Fiber that are topped with seeds or grain or flour instead of a shiny top are free of Eggs but do often contain Honey. Stop by any time or phone to discuss this with Dion or Laurel. 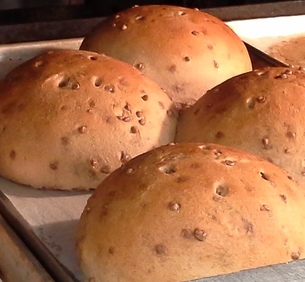 In the meantime, please check back with us here every month as we highlight new breads being introduced. Our menu will be changing often. The following is the April Menu. Breads in bold below can be sliced for your sandwich. Every day - Honey Whole Wheat, Harvest White, Cinnamon Chip and Dakota (Pumpkin seeds, Sunflower seeds, Sesame Seeds and Millet in 100% Whole Wheat) Cedar River Sourdough, made from our starter using a blend of white and freshly milled golden wheat flours. Most days we bake Jalapeno Cheddar Sourdough swirl too. Call at least day before to order rolls or bread bowls. 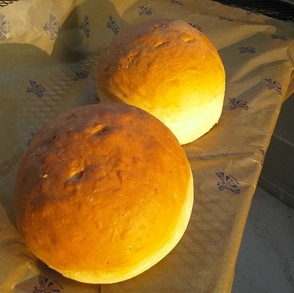 Call ahead to pre-order Hamburger or Hotdog buns made from any bread we are baking any given day. We need to know the day before so that we can begin production at 4:00am to make them. 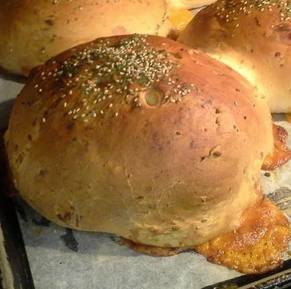 Friday - Irish Soda Bread, Cheddar Garlic, Nine Grain, Marble Rye, Honey Bunnies and Honey Buns (individual bunny shaped rolls) Cheddar Garlic makes amazing Hamburger buns. Call on Thursday if you would like to be sure and reserve a few. 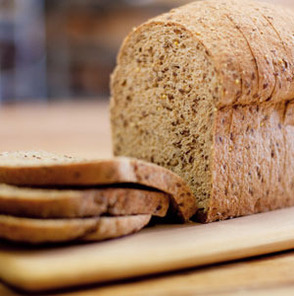 Every Day - Ask about our Gluten Exclusion bread made with Buckwheat and Brown Rice flour. We bake it when we run out and keep loaves in the grab and go freezer at the end of the customer counter. Call ahead to know bake days You may also want to sign up on our email list and note your interest in gluten exclusion products. I will send out email when we bake batches. Every Day: Cafe Mocha Biscotti. Chocolate Raspberry Oh loaves and slices and Bread Pudding! 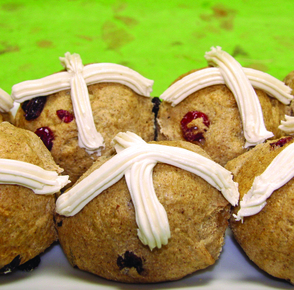 Sweet Whole Wheat buns plump with Cranberries, Golden Raisins, Orange and Lemon Puree, glazed and crossed with butter cream frosting. Don't miss this delectable April Treat! Available only until Easter. A soft white loaf, lightly redolent with garlic and full of big chunks of extra sharp cheddar. This glorious favorite makes up into particularly lovely Hamburger buns or, as many of our customers have found, the best breakfast sandwich buns ever! Just fry a quick egg and you are out the door with a delicious and nutricious treat. 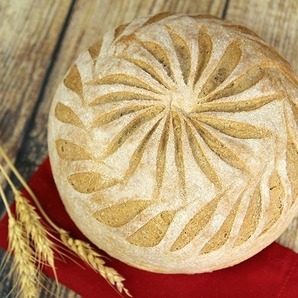 Sunshine in a loaf. This is a soft, lightly lemon flavored white round that comes with a lemon glaze. Elevate any weekend brunch to something special or have the perfect afternoon pick me up spread with a little butter, especially when we all need a bit of extra sunshine at this season!